I'm back from my family jaunt to Montreal. It was a disastrous comedy of errors worth a post of it's own, so look forward to that shortly. Until then, I have a few new shrine thingys to show off. 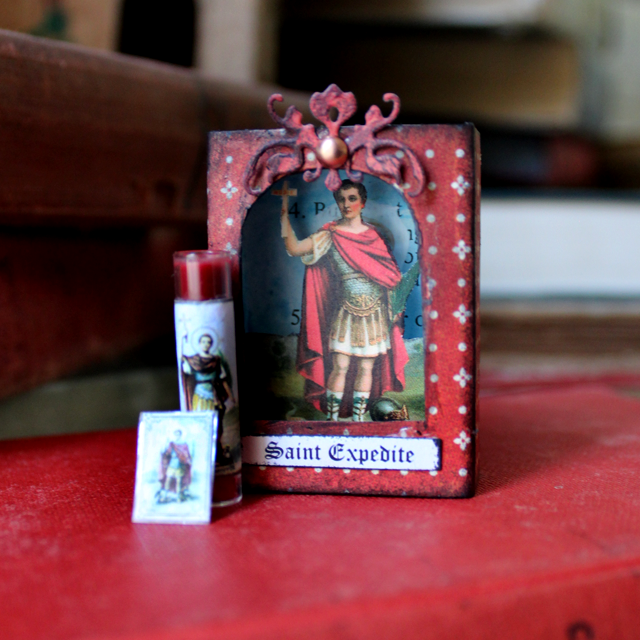 A little something for my dude, St. Expedite. I've talked about this guy many times before. He's an excellent saint to turn to when you have an urgent cause... and I am often in urgent need. 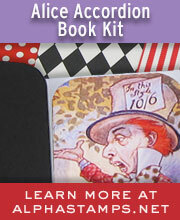 If you're interested in learning more about him, you can find some information here. 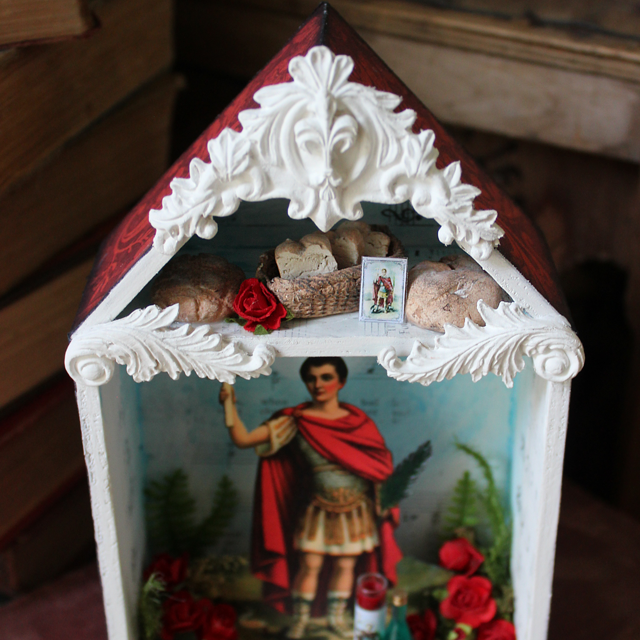 Within my little shrine I've included a bottle of beer, prayer candle, paper flowers, breads and cake and the tiniest little prayer card. I made two of these guys and they are available HERE. 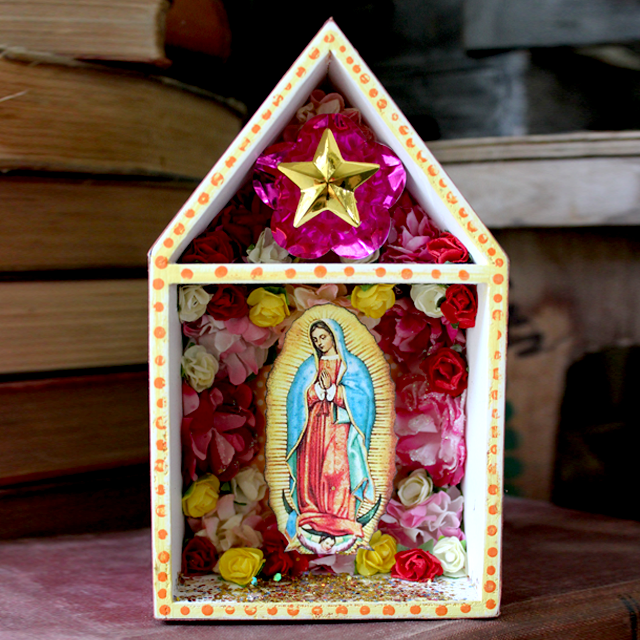 I also created two little shrines for Our Lady of Guadalupe. The Virgin of Guadalupe kept coming across my path and I figured it was high time that I learn more about her. The Virgin appeared to St. Juan Diego in a vision in 1531 requesting a shrine be built on the spot that she appeared. Before agreeing to build the shrine, the bishop told Juan Diego he required proof of her appearance. The Virgin appeared again, directing Juan Diego to collect flowers from a barren area. He collected the flowers in his cloak and took them to the bishop. 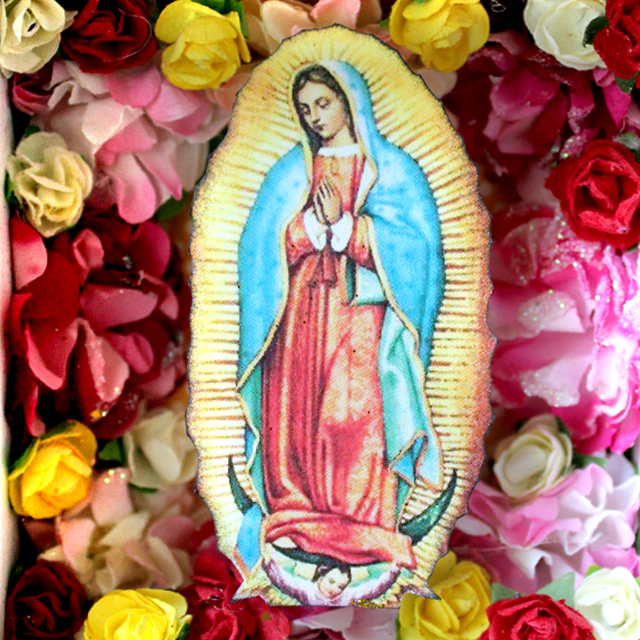 When he emptied the flowers, the image of the Virgin of Guadalupe appeared on his cloak. The cloak is housed at the Bascillica of Guadalupe. There is a great deal of symbolism attributed to the imagery of the cloak. The sun at her back, the moon at her feet, the stars on her robe, the position of her feet, the reflections in her eyes... there is SO MUCH to discover! It's all fascinating and well worth a bit of research if you're interested in that sort of thing. I was raised Catholic, but the images I was exposed to were mostly glum. Even as a child I could never reconcile the messages of celebration with the grim images we were exposed to. The vibrance of the shrines, altars and imagery devoted to Our Lady of Guadalupe seem much more reflective of message of love and joyous celebration. 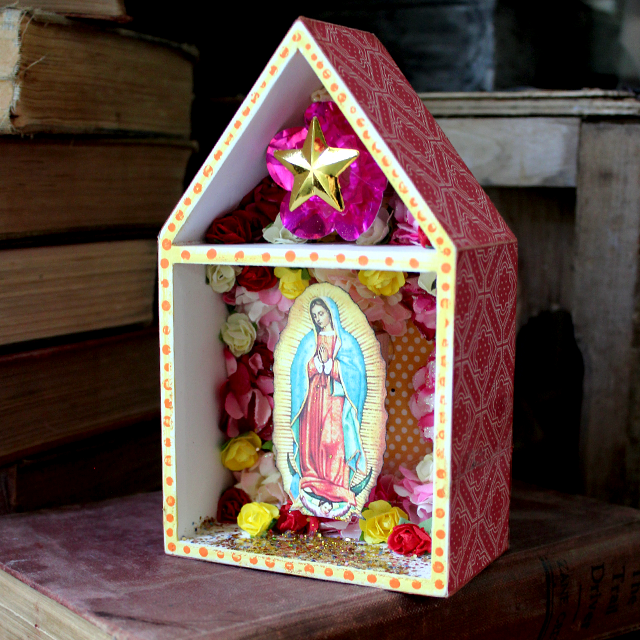 If you're interested in my happy little Lady of Guadalupe shrine, they can be found HERE. 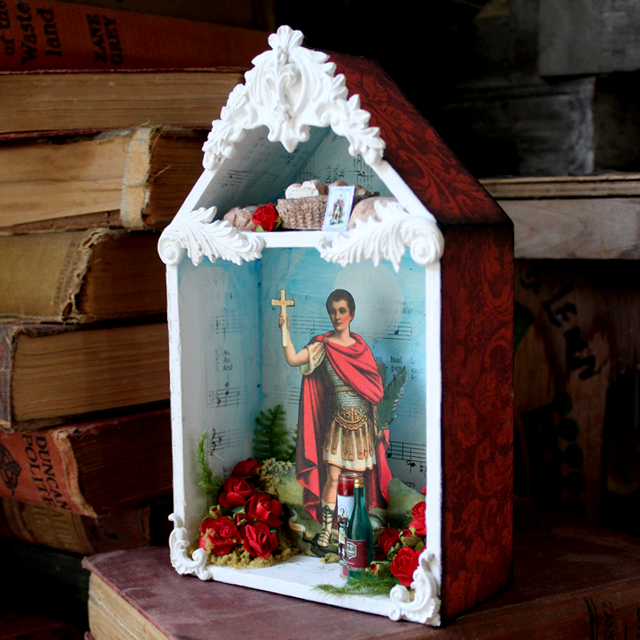 There are 10 of these tiny matchbox shrine available in the etsy shop. 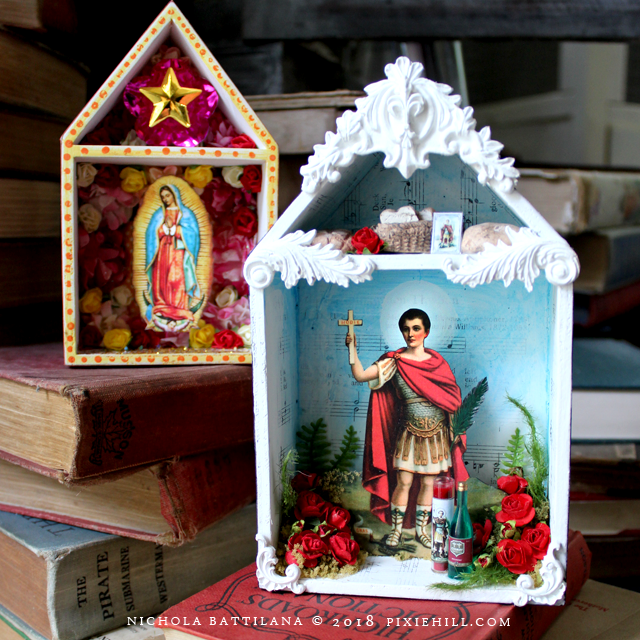 Created using a standard matchbox as a base, the wee paper shrine comes with a miniature 7 day novena candle, and the itty-bittiest laminated prayer card! They can be found HERE.